Park yourself with us and enjoy all the amenities. Swim in our heated pools-6 hole golf course, ceramics, crafts, lapidary, wood shop and hiking club. Fun people enjoying other fun people. Make your reservation now! 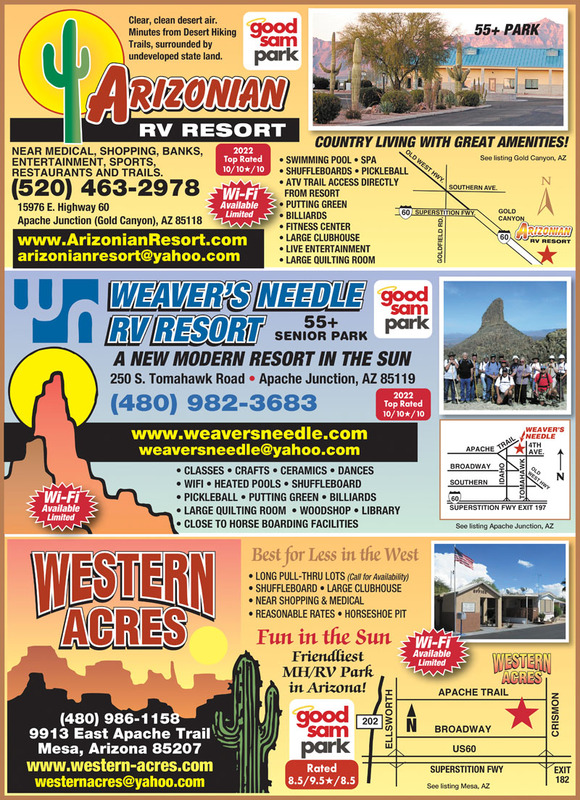 Weaver’s Needle has very friendly guests but the park itself has issues. There is a lot of chatter about dissatisfaction with the management. They are absolutely lying when they say they have Wi-Fi. Their Wi-Fi is absolutely useless and they know it. They pretend at first and even give you a code. When you tell them the code doesn’t work, they say “maybe at 4 a.m.” and then they suggest you go to the public library. After we paid, we were given a rule book that included the rule that you could not have your own washer or dryer. We have a Splendide in our RV and I would never have booked at a park that required me to use a Laundromat. They should list their rules on the internet so you know the rules ahead of time. The park also uses disgusting powerful deodorizers in their office and clubhouses. I know that many of the residents let the management know that they hated the deodorizers and that it gave them headaches, sore throats and made their eyes burn. The management ignored their concerns. The park does have a pet section and a pet park but there is a strong hatred of pets by many of the non-pet people. You are not allowed to walk your dog anywhere but in the pet section. I heard many comments from people who accidentally walked on the wrong street and people came out and yelled at them. I wish they controlled the motorcycles as much as they do pets. We had the misfortune of having numerous motorcycles around us and one guy would back up right next to our RV and run his engine. He woke me up early in the morning as well as late at night. The pool at the park is very small and has no ambiance. It is sandwiched between two buildings with walls on both sides. It is functional but not nice. The sites are tight and you are very close to your neighbor. If you have a smoker or a neighbor with an old diesel truck (like we did), you might have to close all your windows like we did. This was our first visit to AZ so I don't know much about other areas but Apache Junction was VERY dusty. It also doesn't have many restaurants. 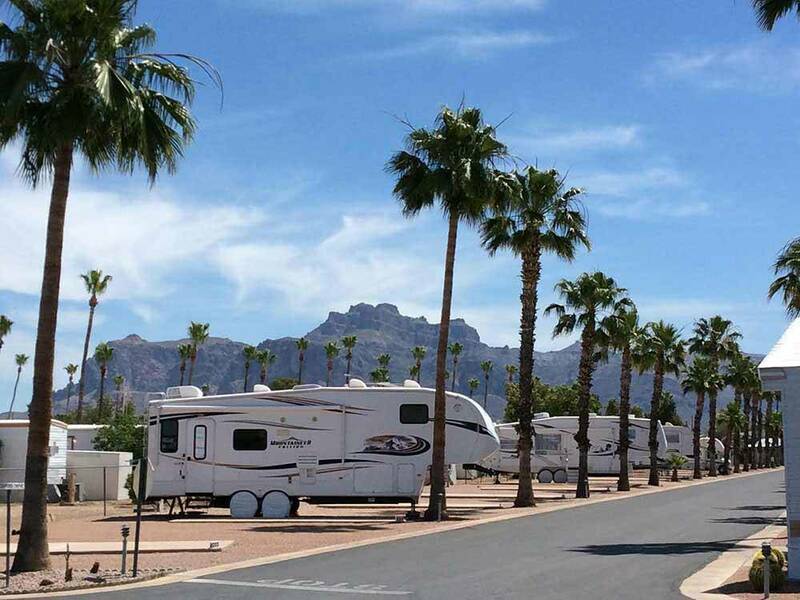 The only thing Apache Junction has going for it is that it is close to the Superstition Mountains for those who like to hike. If you are a first time visitor to AZ, don't make the mistake we did. Be very careful about what site you accept. The sun is brutal and RV awnings don't offer much shade if you are on the wrong site. Checked into Weaver's Needle late on a Thursday Afternoon after a long day of driving. The staff and residents were friendly and extremely helpful in finding our lot. The park has over 400 sites and is clean and well maintained. The Park Managers go out of their way to make sure their residents ( more like family members) are well taken care of and respected. The park offers numerous activities, including classes, dinners, cards, horseshoes and numerous other activities. The pool is well maintained and heated for winter enjoyment. Although this is our first winter in Arizona we were immediately accepted into this community and made to feel right at home. This is an older Park but the current managers, are doing an amazing job of keeping it up to date, clean and active. The sites are large and level with cement patios and ample parking for tow vehicle. If you are heading to AZ for the winter check them out, you won't be disappointed.